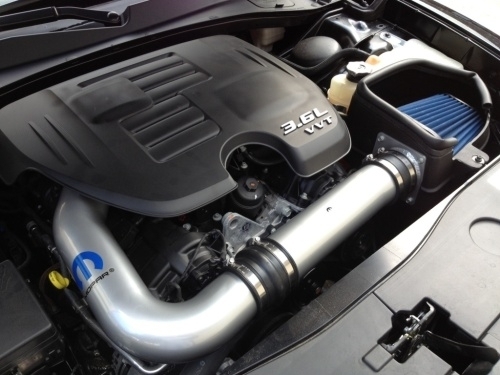 3.6L Engines - Mopar Performance is proud to bring your Dodge Challenger a genuine Mopar Performance OEM Cold Air Intake. This Performance quality Cold Air Intake increases air flow to your engine by as much as 20% and is one of the best dollars-to-horsepower investments you can make. Tested to boost torque up to 10 foot pounds and horse power up to 10. This gain in power doesn't sacrifice anything and will actually improve fuel economy by 1 or 2 mpg's depending on driving style. This Dodge Challenger Cold Air Intake is street legal in all 50 states and has been tested to comply with emissions standards. Our Cold Air Intakes are easy to install and typically installation can be done with a screwdriver, pliers and a ratchet set in 90 minutes or less. These Intakes are designed specifically for your Challenger and use existing factory holes and mounting points. Not to mention, this Cold Air Intake will give your Challenger a deeper, more powerful sound. Missing a M60 bolt. Emailed customer service for part or where to get one. They asked for order # which I gave. Have not heard back. That was two weeks ago. Still waiting for any kind of response.